After a long day of work, all we want is comfort food. Good thing it's so easy to whip up Baked Mac and Cheese at home! Perfect as movie marathon munchies! 1. Bring to boil Chef's Classics Fennel Pasta Cooker. Boil elbow macaroni into al dente doneness. Make sure it is a bit firm, not too cooked. Set aside. 2. Heat saucepan using low heat. Melt butter and add in flour. 3. Using a Chef's Classics Stainless wire whisk, gradually add the milk. Mix well until milk mixture is smooth. 4. Add in grated cheese and nutmeg. Continue mixing with whisk. 5. Lastly pour in cooking cream then, combine well. Once cheese sauce is ready or has thickened up, turn off the heat. 6. 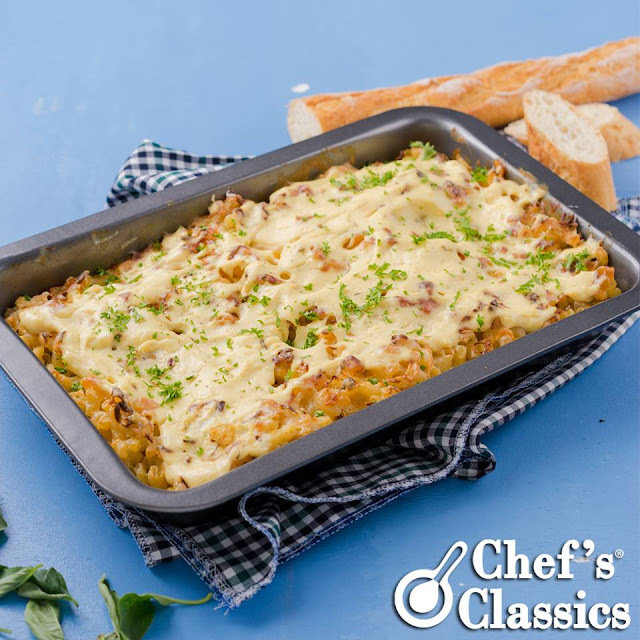 Combine macaroni and cheese sauce in a Chef's Classics baking pan. Mix well and put the remaining cheese on the top. 7. Bake in preheated oven for 30 minutes, or until hot and bubbly. Let cool 10 minutes before serving. 8. Best served with garlic bread.